Drivers in D.C. soon will begin receiving tickets from more than 100 new traffic cameras that can catch more than speeders. City officials say live ticketing will begin Feb. 1. following a nearly month-long extension of the grace period. The new cameras can detect drivers who are not stopping at a stop sign or for a pedestrian in a crosswalk. Some are monitoring cars that "block the box," meaning they stop in the middle of an intersection, causing gridlock. These cameras can even ticket vehicles that go down neighborhood streets. Previously, the city had said that the new cameras would begin to issue tickets Jan. 6. But the grace period was extended so that all of the camera locations locations had clocked 30 days of issuing warning citations. 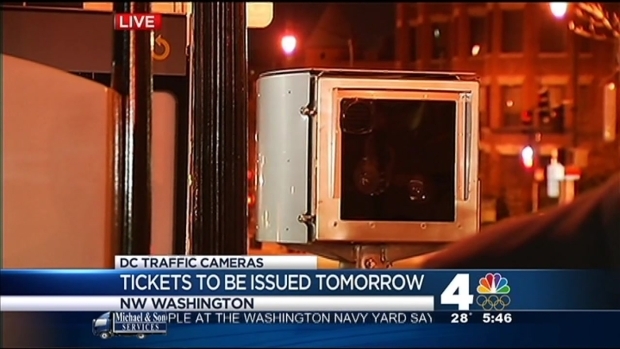 The new cameras are of a program that the district has dubbed "D.C. Street Safe." Fines for the offenses will vary. Failing to stop at a red light, failing to stop on red before turning right or turning right on red where it is prohibited carries a fine of $150. Speeding fines range from $50 to $300, depending on how far over the limit the car is going. Failing to clear an intersection carries a fine of $50, while failing to yield to a pedestrian in a crosswalk -- or passing a car that is stopped for a pedestrian -- means a $250 fine. Overweight commercial vehicles can be fined $250 or more, and trucks where they are restricted can be fined $150. As with existing automated traffic cameras, the ticket will be mailed to the registered owner of the vehicle.